I hope I didn’t scare you too badly! But let me tell you, the leaves are changing color, the air is getting cooler and it’s giving me the chills! Where did summer go? As we know, the cooler weather is inevitable, but fall isn’t so bad, especially when we have Halloween to look forward to! As a dietitian, I would love to say that handing out a healthy apple instead of candy is a perfect way to make the holiday a little more nutritious… but I would be lying. Truth be told, that was my least favorite trick or treat goodie. 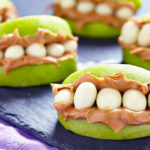 Of course, that’s not to say we can’t make Halloween healthy – c’mon, I’m a Dietitian! So, how do we make the season healthy? By getting the kids involved and making it fun! 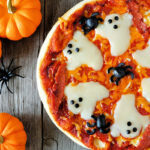 I’ve gathered some of my favorite Halloween ideas that will be fun for the kids and also provide some good nutrition! Fruits and vegetables are all you need to make this adorable Halloween scene! 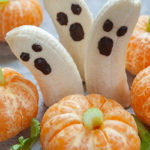 This is great for the little ones in your family, because they can help peel the bananas and oranges and they can add the face to their ghost! I personally like to use raisins for the ghost, but I’m sure the kids won’t argue if you use chocolate chips instead. Everyone loves pizza! Start by taking your favorite whole wheat pizza crust and add-on a lower sodium pizza sauce. When topping with cheese, do a light layer of reduced fat cheddar cheese and then add-on slices of reduced fat mozzarella. The cheddar will add a bright orange color, while the sliced mozzarella will be perfect for your ghosts! Use black olives to make spiders and small faces for your spooky little ghosts. Tip: We have numerous whole wheat pizza crust options at the store! Check in both center store as well as near the deli for some great options. Be sure the first ingredient reads: whole wheat flour. 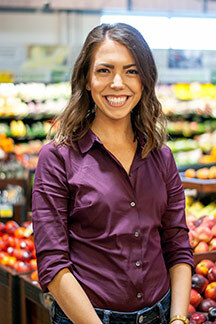 This is a simple trick you can use to find whole grain products throughout the store! 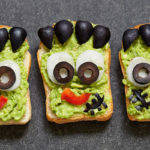 We all know avocado toast is trending, but let’s switch it up a bit and make these fun little Frankensteins at breakfast. Avocados are one of the only fruits that provide healthy monounsaturated fat, which will also keep you fuller longer! Be sure to use whole wheat toast as well. You can use olives, red peppers and the egg whites from hard-boiled eggs to make your Frankenstein as friendly or as scary as you’d like! 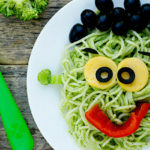 You’ve heard our dietitian team loving up on veggie spaghetti, but how cool is this meal!? You can heat up the veggie spaghetti with some pesto in a skillet for a few minutes until cooked through. Then, add-on slices of cooked egg yolks, black olives, and some red peppers to make a perfect meal for Halloween!